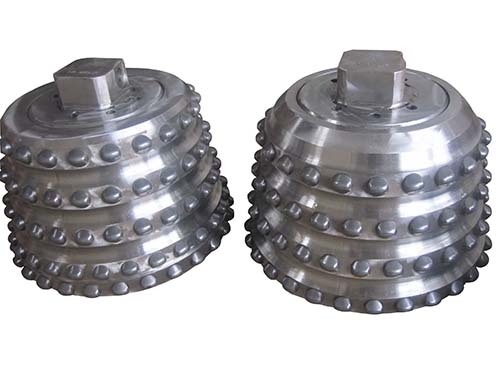 Cutter cones are forged with high quality alloy steel and heat-treated to high strength and wear resistance. Carbide inserts can be selected from a wide range of shapes, sizes and carbide grades to improve service life and penetration rate. Carbides are inserted in cones with different number of rows. The match of cutters with different rows carbides produces different row spacing to suit different rock formations. Combined axial-radial roller bearings or tapered roller bearings improve cutter operating loads, so the raise borer has a high penetration rate. The metal seal and pressure balanced device are utilized to improve sealing ability, prevent leakage of lubricant and ingress of foreign materials, and the cutter bearings have longer lifetimes. Raise boring cutters can be easily mounted on the saddles and positioned in raise boring head in certain patterns with different row spacing for different formations. Our raise boring cutters can be interchanged with SANDVIK and ATLAS COPCO raise boring cutters. You are browsing our raise boring cutters, raise borer cutters. We also manufacture TBM disc cutters, TBM cutter rings and RCD roller cutters.